Before playing Enbrighten, we work alongside our students to develop classroom norms, establishing a safe classroom environment where collaboration and risk-taking are encouraged. We often begin by watching an effective learning group in action. Austin's Butterfly (link right) is a great resource to encourage class brainstorming. Common themes often include: collaboration, providing feedback, listening to others, changing ideas, and speaking intentionally. Using that as a starting point, we then link those ideas to our norms for thinking. Q: What if students don't come up with the norms you've developed? A: After creating a list of common themes we notice from Austin's Butterfly, we look to see which ideas connect to the norms we are trying to identify. 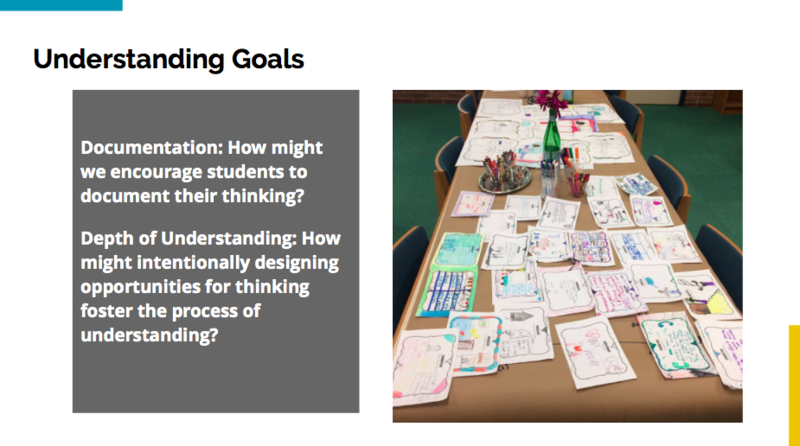 For instance, if students say they notice the students thinking together, we link that to the idea of "calling a classmate" to help generate ideas if we feel stumped. Typically, the generated ideas do link in some way. If not, we would just mention them to the class as a possible suggestion. After all, as educators, we are part of the classroom community, so we are free to mention our ideas to the class as well. We have shared the norms we have found to be most successful in our classroom, but there are certainly others that may work just as well. We are all experts of our own classrooms and you can certainly adapt whatever works best for your students as you see fit. Then share them with us so we can all benefit from your expertise! Classroom Culture from Julie Rains on Vimeo. Another fun way to develop and later review norms with students is by collaborating to create a classroom video. Students can be part of the process and watch the video as needed until the norms become a natural part of the classroom culture. If you want to work with a team of colleagues, this can also provide a consistent message. After we have established a positive classroom culture with our norms, we start to introduce the game. When we had a small group resource setting, each student had their own role (adaptation suggestions for larger classes are below). Initially, we don't spend a lot of time up front discussing each job. We find that assigning the roles initially as Erika often explains is a great way to observe where students are currently functioning. We encouraging students to use their sentence starters to help frame their responses, so we don't find we need to spend as much time teaching the strategies explicitly up front. If we see the group or individual students having difficulty with specific jobs as the year progresses, we will create mini lessons to support their areas of need. Q: How can I use this in a class of 20-35+ students? Instead of assigning each student an individual strategy job, assign groups. Have each strategy group sit together. At a comfortable stopping point, students in the same group share their ideas for 1-2 minutes. (If students used one large sheet of paper, they can connect their ideas or add details during their discussion). When the class “shares out,” randomly select one member from each group as speaker. After the speaker shares, you can move on to the next group or have other members of the same strategy group share as well. Students will earn points as groups instead of individuals. Any group earning more than 5 points in a class period wins. Q: What if my small group has less than 7 students? A: Don't worry. You can simply choose strategies for each student in the class. That will mean that every strategy isn’t assigned, and that’s okay. If you want to discuss each job, you can review the unassigned strategies as a whole group after your students share. We tend to start with Visualizer, Summarizer, Connector, and Vocab Master with smaller groups and then have the whole group discuss Questioner, Clarifier, and Predictor as a class to start the year. Q: What if I only have 1 student? A: If you have one student, you can provide more individualized support with each comprehension strategy. Start by assigning and discussing the job with the student. Then, proceed as you would with a larger class and read the text to the student (or have the student read it to you if you prefer). Then, give the student a chance to complete their job and share out with you. To provide an additional model, you may want to also choose a job and share out. The key will be to try and model what an authentic classroom discussion might look like. If you see different students on an individual basis several times a day/week, you could also have them interact using the same passage at different times via an online resource (like an EdModo group, blogging website, video, or journal). That would allow the students to practice their writing and/or speaking skills without being in the same room, at the same time. As you begin to use Enbrighten in your own classroom, you may benefit from some additional teaching tips along the way. We have included some frequently asked questions and our suggested solutions below. Please feel free to contact us if you have additional questions by accessing our Contact Us page. Q: Can this be used with narrative, informational text or both? A: We have used Enbrighten with written materials ranging from a science textbook to a book of poetry. However, we do use a slightly different format for informational text (see the question and answer below). Q: What order should I call on students when reading informational text? A: When reading different types of texts, you may want to call on students in a slightly different order. However, the key with informational text especially is to do the jobs before reading the text to preview. After that, it doesn’t matter as much since the students start to get in the flow of the game. Before reading informational text, we would suggest the following order: Predictor, Vocab Master, Visualizer, Clarifier, Connector, Questioner, and finally, Summarizer. If you call on students in this order, it will allow the Predictor to preview the text and make their best guess on what the text will be about. It will also allow the Clarifier to identify the type of text. The Summarizer can be tricky, but have them create a summary before reading and have them check their response at the end of the game. Another variation is to have a few jobs share out before reading (like Predictor, Vocab Master, and Questioner) and then have the other jobs share out after the first stopping point. This is my preferred method and can also shorten the amount of time it takes to play Enbrighten if you are feeling pressed for time (and who isn't these days?). Q: How do I plan where to stop? A: There are several ways to decide how to reach a comfortable stopping point. Really, it depends on your lesson objective and the amount of time you have to spend playing Enbrighten. If you have a class period or set reading time, you may want to consider how long it might take to read each section aloud and then factor in discussion time to help you determine how far you will need to read in order to fit your time parameters. At first, it may take some practice to determine the "right" stopping point. Almost always, it will take longer at the start of the year while you get used to the game. In general, we typically begin by looking at the natural structure of the text before we begin. Is it divided into chapters? Does it have a beginning, middle, and end? Is there a natural plot shift in the section you plan to read? If so, those might be great places to pause and reflect. Another key consideration is the complexity of the text and its difficulty relative to your student population. If you are working with Shakespeare for example, you will likely need to read shorter passages and discuss more often to unpack the complex language. If you predict the text will be easier for students (they have extensive background knowledge, words are easily decodable, etc. ), you can get away with reading larger chunks of information. Q: What happens when a student will not attempt their role? A: There are a wide variety of reasons why a student would be hesitant to participate. However, we have observed two common reasons. The first reason is that a student does not understand what to do. If that is the case, prompt that student to use their sentence starter by reading it to them. Try to encourage them to finish that thought. If that doesn’t work, perhaps the student has not yet developed the confidence to “take a chance” on a response. If that is the case, remind the student that the answers in the game are not really important and you are really interested in their reasoning. If they write an answer (even if the answer is unrelated), praise them for “starting the discussion” and give them double bonus points. Continue in this manner until the student feels confident trying an answer. Q: Can I have the whole class practice doing 1 or 2 roles instead of all 7? Q: How do you go slow to do well? This is perhaps the trickiest part of all. As educators, we want to ensure that our students "master" a concept the first time we "teach a lesson." We can probably all remember a lesson we worked to perfect for hours, days, or even weeks only to find our students scratching their heads and perhaps commenting they "don't get it." Perhaps this stems from being so passionate about education and our students...we want to be perfect teachers all the time. The tricky part is giving our students (and ourselves) a break. We certainly wouldn't expect a child version of Justin Verlander to throw a perfect pitch at his first Little League practice. Similarly, our students may not share "perfect answers" (if there is such a thing) the first time they practice using a comprehension job. That's where a growth mindset comes in. In her book, Mindset: The New Psychology of Success, Carol S. Dweck, Ph.D. explains that "...it’s not just our abilities and talent that bring us success–but whether we approach them with a fixed or growth mindset" (Amazon). If we believe that our first lesson is a starting point for future growth, it is easier to remember that it will take weeks, months or years to master these skills. So, if a student shares a one word response, let them share that response, ask others to build on that idea, and then go back to that student to see if they would like to add any other ideas based on the discussion. If they don't want to add anything... accept the response, document, and then wait to see how it plays out the next time. If there isn't observable growth over a few weeks, then it may be time to stop and meet with that student 1:1 or teach a mini-lesson on that particular skill. With practice, students will improve these skills. Initially, it is about creating a safe environment where students feel comfortable admitting they aren't sure and are willing to take a guess. The rest will grow over time. Q: What's the difference between points for a role and points on the rubric? A: Points for a Job- To clarify, students can earn points while playing the game. Typically, students or teams of students will have their names listed on the board next to their assigned role. Throughout the game, students earn points in hopes of "winning" the classroom reward/incentive at the end of class. We usually say that any student or group who earns over five points is a "winner" to encourage collaboration rather than competition. Students earn these points by: attempting their assigned roles; following the norms (connecting to other's ideas, calling a classmate, sharing evidence and reasoning or changing their mind based on evidence/reasoning); taking a risk; or engaging in any other behavior you are trying to reinforce during the game. We should note, that eventually, students begin to care less about the points and become more focused on the discussion and learning as its own reward. As this happens, it's a great idea to taper the points away to encourage intrinsic motivation. Points on the Rubric- Perhaps it might help to think about the rubric numbers as scores rather than points. Using the rubric (below) educators can track student growth related to the basic reading comprehension strategies. Although you may want to share this rubric with students, in contrast to the points above, these scores do not determine whether or not a student “wins” the game. Rather, these scores are designed to track student progress over time as a formative assessment tool, allowing for differentiation and intervention as needed.